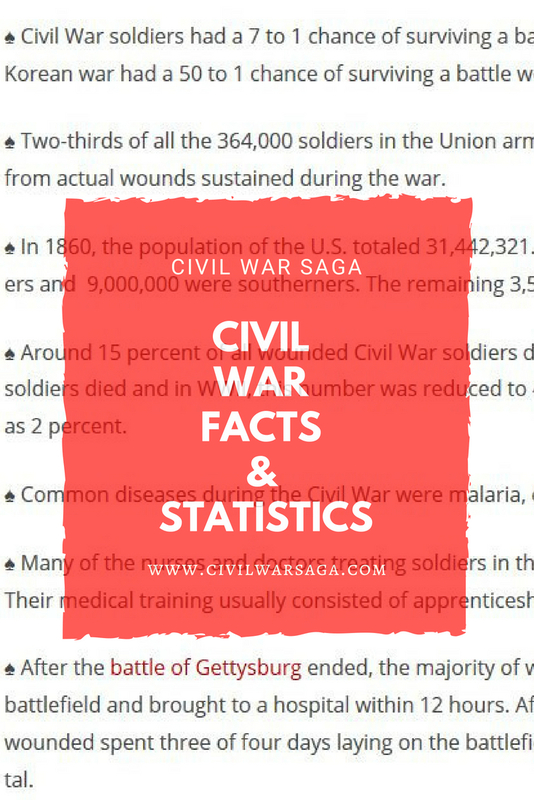 There are many myths and misconceptions about the Civil War. Here are some facts and statistics to set the record straight. ♠ Civil War soldiers had a 7 to 1 chance of surviving a battle wound. In comparison, soldiers in the Korean war had a 50 to 1 chance of surviving a battle wound. ♠ Two-thirds of all the 364,000 soldiers in the Union army died of disease. Only one-third died from actual wounds sustained during the war. ♠ In 1860, the population of the U.S. totaled 31,442,321. About 23,000,000 of these were northerners and 9,000,000 were southerners. The remaining 3,500,000 were slaves. ♠ Around 15 percent of all wounded Civil War soldiers died. In WWI, only 8 percent of wounded soldiers died and in WWII, this number was reduced to 4 percent. In the Korean war, it was as low as 2 percent. ♠ Common diseases during the Civil War were malaria, dysentery, arthritis and typhoid fever. ♠ Many of the nurses and doctors treating soldiers in the Civil War never attended medical school. Their medical training usually consisted of apprenticeships for medical practitioners. 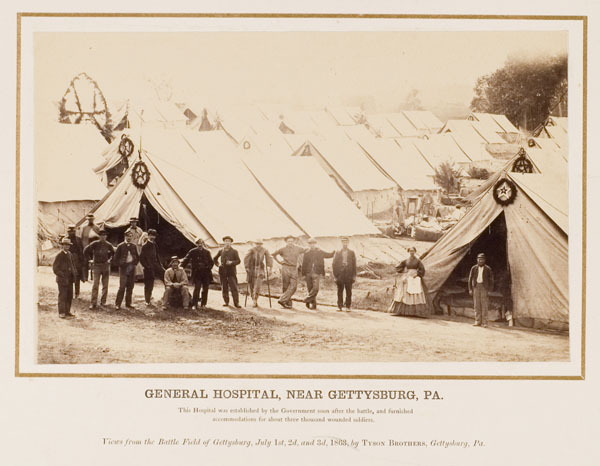 ♠ After the battle of Gettysburg ended, the majority of wounded soldiers were retrieved from the battlefield and brought to a hospital within 12 hours. After the battle of Bull Run, most of the wounded spent three of four days laying on the battlefield before they were brought to a hospital. ♠ About 80 percent of the wounds soldiers received during the Civil War were in the soldier’s arms, hands, legs and feet. ♠ More than 3 million men and around 400 women fought in the Civil War. ♠ Around 600,000 people, roughly around 2 percent of the U.S. population, died in the Civil War. ♠ Bounties were offered to new recruits to encourage them to sign up for the army. A few states, like New York, offered as high as $677 dollars. “Bounty jumping” quickly became a problem. Many recruits signed up, then deserted and signed up again in another state. ♠ Only 1 percent of the population in the north were African-American men yet they made up 10 percent of the Union army. Around 85 percent of all the African-American men eligible to enlist did so. ♠ The first federal income tax was established in 1862 to help finance the Civil War. ♠ About 29 percent of the 1,080 United States Army Officers at the outbreak of the Civil War resigned and joined the Confederate army. ♠ The average age of Union soldiers at time of enlistment was 25 years. ♠ The United States government spent $6,190,000,000 on the Civil War, according to an estimate in 1879. ♠ One in every 4 Union soldiers was an immigrant. The majority of these immigrants were Germans and Irish. ♠ The Union army suffered a total of 642,427 casualties while the Confederate army suffered 483,026. ♠ The Union Army had a total of 2,672,341 soldiers. About 2,489,836 of these were white soldiers, 178,975 were African-American soldiers and 3,520 were Native-American soldiers. ♠ The bloodiest battle of the Civil War was the three-day-long battle of Gettysburg in 1863 with a total of 51,116 casualties. Yet, the battle of Antietam in 1862, which had 22,726 casualties, had the greatest number of casualties of any single day battle. ♠ The mortality rate for Union prisoners of war was 15.5 percent while the mortality rate for Confederate prisoners of war was 12 percent. Hughes, Mark. New Civil War Handbook: Facts and Photos For Readers of All Ages. Savas Beatie, 2009. Are there stats regarding the number of guerrilla organizations that operated in the Civil War? Is it true fact that the major cause of death in the Civil War was tetanus because most field hospital were set up near livestock areas? Did the doctors and nurses of the Cival War know that most of the places where they set up hospitals were near livestock areas in the first place, and could they have known about tetanus as well? It seems to me, that even then, the MD’s and nurses could have used more common sense in where they did their work. I know they were more concerned in getting to the wounds of the soldiers ASAP. The amount of large numbers of killed and wounded on July 1,2,3 1863 at Gettysburg, PA. put a major SHOCK into American public at large, but it had to be expected at some time during the battle. I heard that the cannons could be heard all the way back to Washington, D.C. from the battlefield. This is so hard to believe that these are true facts.